We wonder why Subaru and Toyota like to tease U.S. fans of the Scion FR-S and Subaru BRZ sports cars with Japan-only models. Subaru just did it with the 2016 BRZ tS they just released for the home market in Japan and now Toyota comes up with their own GT86 limited release special spec sports coupe. It’s called the GT "Yellow Limited" and it will be ultra-exclusive with only 86 of these special models released for sale in Japan. It comes with special aero parts to set it apart from the standard GT86. It features the Sunrise yellow exterior paint that comes on the Toyota GT race car. It also gets a custom black interior with Ashirai yellow stitching on the leather Alcantara seats. Along with the Sunrise yellow paint, it comes with unique black door mirrors, 17-inch black aluminum wheels and a yellow 86 badge on the fenders. There’s no modifications underneath to the engine or drivetrain. It still comes with the 2.0-liter boxer producing 200hp. It comes mated to a 6-speed manual gearbox and 6-speed automatic transmission. 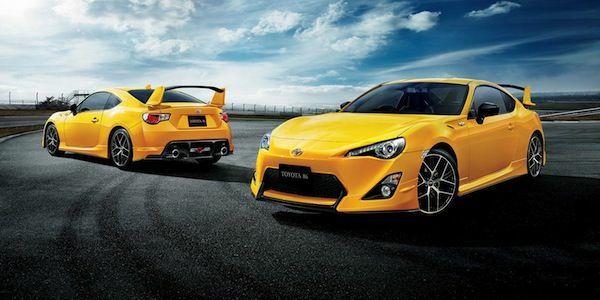 GT86 "Yellow Limited aero package FT"
Another limited model will be the GT86 "Yellow Limited aero package FT." It will get a custom front-rear bumper spoiler, rear large spoiler, mudguards, and undercover aerodynamic parts that will set it apart. It’s further set apart with BBS18 inch forged aluminum wheels wrapped in Bridgestone Potenza S001 tires (front 215 / 40R18, rear 225 / 40R18), sport brake pads and special Sachs sock absorbers. Toyota says both special limited edition 2016 GT86 models will be available to order now until September with production starting in November. Here’s another Scion FR-S / Subaru BRZ that U.S. buyers can only look at and not touch.